Founders of Falling Andes. Photo by Gerri E. Acri. 2011. From left to right: Jordan Wood, Daniel Peluso. Falling Andes at Stage AE. Pittsburgh, PA. 30 March 2012. Photo by Chelsey Engel. Click for full image. I have been a musician and songwriter my entire life and have participated in various bands and solo projects. In 2005, I acquired an Associate of Applied Science in Music Business and minor in Songwriting at McNally Smith College of Music in St. Paul, MN. After my Music Business degree I gained several years of promotions and marketing experience working with major record labels at Warner Music Group, Universal Music Group, and Island Def Jam. Working in the music industry gave me valuable experience that not only advanced my current resume and professional skills, but also allowed me to manage and promote my own music with some degree of commercial success. During the years of 2008-2014 I put out three professionally recorded albums, received radio play at AAA stations, achieved national and local press (check out this article in the Pittsburgh City Paper), successfully placed a self-produced music video on Fuse TV, opened for national acts, performed concerts in New York City and Chicago, and even caught the attention of a few major record labels. In all of my musical projects I have acted mainly as the lead singer and main or co-songwriter, but also played the guitar and keyboards. My most recent band, Falling Andes, is one I am most proud of. You can read more about Falling Andes at our bandcamp page, but recommend the Pittsburgh City Paper article, Falling Andes comes back after early Internet hit with EP years in the making, for a more comprehensive summary, that also serves as a good period piece for where we last left off with the group. Please enjoy some of the music below that I have been fortunate to have been a part of creating and performing with some of the best musicians I have ever met. Info: Recorded at Audible Images (Pittsburgh, PA) by Stan Kleja and Frank Soriano. Additional recording at Falling Andes' home studio and Frank Soriano's home studio. Produced by Falling Andes and Alex Smolinski. Mixed by Alex Smolinski (Butch Vig's Emperors of Wyoming, Lola Ray, Gym Class Heroes, Nada Surf). Mastered by Andy VanDette (Beastie Boys, David Bowie, Atomic Tom). Info: Falling Andes debut album. Produced by Falling Andes and recorded and mixed by Dave Hidek of Tree Lady Studios (Pittsburgh, PA). The first single, San Francisco, quickly garnered attention from music blogs, print publications, and college and AAA radio stations. The title track, Frantic, is the second single off the record. Falling Andes at Stage AE. Pittsburgh, PA. 8 December 2012. Photo by Hugh Twyman. 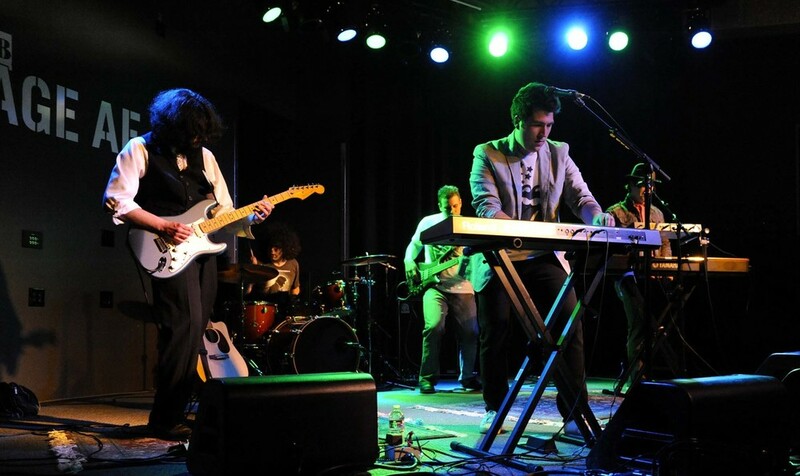 Band members from left to right: Toni Crough (Drums), Mike Boyer (guitar), Jordan Wood (keys), Daniel Peluso (vocals). Info: Below are additional songs and music videos. The stop-animation music video for Rabbit Hole was featured on Fuse TV in 2008. The music video for Frantic is a collection of random photographs from different events throughout my life (concept by Jordan Wood).